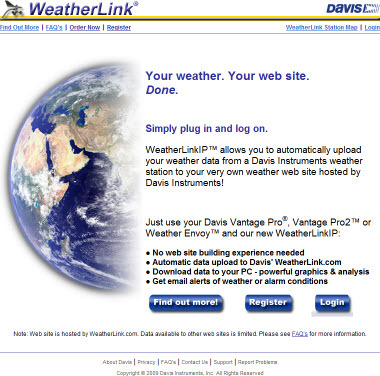 Important Note: This page is specifically about the WeatherlinkIP logger, but the description further below of the Davis weatherlink.com 2.0 website and all its features also applies fully both to use with the Weatherlink v6 subscriptions and with the Connect product, which are also compatible with weatherlink.com uploads. Please see the note at the foot of this page for further information on using these alternative upload approaches. The 6555 WeatherlinkIP logger is one of five loggers in the Davis range that are special-purpose or advanced in that they offer all the features of the standard serial and USB loggers, but also provide further special features relevant to particular applications. (These are additional to the standard 6510USB and 6510SER Weatherlink data loggers.) The WeatherlinkIP logger is described in detail below – see the Streaming Loggers page for information on the other four advanced loggers, which includes, for example, a unit able to control external equipment. The 6555 WeatherlinkIP logger is similar in function to the standard 6510 Weatherlink loggers but is different in two important ways. First, it has an Ethernet (network) interface and so connects not direct to a PC but to a standard TCP/IP network or router (which also gives the possibility of connecting to a PC at long distance via a TCP/IP link). Second, the 6555 logger is able automatically to upload current weather conditions every minute directly to a special website run by Davis at www.weatherlink.com. This displays your weather data online in an attractive visual presentation (see half-size sample image right and live screens at bottom of page), indexed by its position on a world map and also provides further upload and download features. This special upload facility does not require a local PC at all and is therefore the very simplest method of getting your weather data online. But it is still also possible, if you wish, to have a local PC and do all the local logging and processing of your weather data that the standard 6510 logger allows (and all at the same time as the automated uploads to the Weatherlink website). While some of these features – such as long-distance data links – have been possible previously, they have required substantial technical expertise and added costs to implement. With WeatherlinkIP, it’s now relatively easy for anyone to set up these various types of data link – a very significant advance. The main body of the 6555 logger is similar to other WL loggers and it fits into the Standard or Envoy VP/VP2 consoles or Vantage Vue console in exactly the same way. (It can be used with older VP1 stations as well as the current VP2 models.) There is a short (10cm) lead from the logger, which terminates in an RJ45 socket – fitted with a green status LED – for connection of the network cable and with a substantial ferrite core midway as an anti-interference measure. This makes the logger lead bulkier than on the standard loggers but not obtrusively so. Note that because of the extra power draw of the TCP/IP interface, the console must always be on supplementary power (ie typically the standard mains adapter) for the 6555 logger to be active – internal batteries alone are insufficient. Powering the AC adapter via a small, inexpensive PC UPS (Uninterruptible Power Supply) of its own is therefore recommended (e.g. an APC BE325-UK with UK-style mains sockets). Virtually all private networks will meet these two conditions. For larger networks in organisations, please consult your network manager if in any doubt. The 6555 logger will typically be connected to a TCP/IP network in one of two ways: it connects either to a standard Ethernet LAN hub/switch via the usual Cat 5 patch cable or, if used as the only network device at a remote weather monitoring station for example, it can connect direct to an Internet router/modem and thence to a phone line (note though that the 6555 cannot be connected directly to say an ADSL phone line, you do need a router/modem to provide the Internet interface). The cable length between IP logger and network point is subject to the same rules as network patch cables in general – typically it will be relatively short (a 2.4m/8ft cable is supplied with the logger) but a Cat5 cable length up to 100m is allowed. Important note: The 6555 logger is not itself a wireless (WiFi) device but can connect into a WiFi network if cabled to a suitable wireless access point (consult your local network supplier). Like all network devices, the 6555 logger needs an IP address to identify itself and is set by default to acquire its address automatically by DHCP when first connected to the network. In general your modem/router should provide this DHCP service automatically but, if you should prefer to do so, a fixed IP address can readily be assigned (provided an initial IP has been assigned via DHCP). Important Note: It should be appreciated that the IP logger is not a server for weather data – it can only support one request for data at a time and any attempt to fire multiple simultaneous requests at the IP logger will result in a confused logger that may need the console to be rebooted. In other words, the logger must only be expected to undertake one task at any one time whether this be uploads to weatherlink.com or to service data requests from local software. The Davis Weatherlink software is specially written to co-exist happily with uploads to weatherlink.com but other third-party software may not play as happily. As noted above, use of the Virtual VP software may provide a solution if your application calls for two or more applications to access the IP logger’s data simultaneously. The website at www.weatherlink.com is the special high-capacity site that receives automatic data uploads from all 6555 loggers around the world . (NB This upload is enabled by default but can be disabled if preferred.) It is also the only website to which direct data uploads can be made – in other words, the target server for the WeatherlinkIP data uploads cannot be changed. Note: Uploads to the weatherlink.com website an also be made from both PCs running the Weatherlink v6 software and from Vantage Connect units. All features described in this section on the weatherlink.com website apply equally to these alternative upload approaches, but please see the note at the foot of this page for further information on using the Weatherlink v 6 software and Connect units in this way. In addition to the automatic data uploads to weatherlink.com, a 6555 logger can also be contacted in the standard way by a PC via any LAN or longer-distanceTCP/IP link that has a known (or forwarded) IP address for general-purpose data uploads; standard Weatherlink-compatible software running on the linked PC can then upload web pages to any nominated web server – none of this standard flexibility is lost with the 6555 logger. The greatest virtue of the 6555 logger is that all of this website capability is available very simply. Literally all that’s necessary for most users is to: (i) set up the weather station and just plug the logger in to a network point connected to the Internet; and (ii) register your logger at the Weatherlink website so that it knows where in the world you’re located. Within a couple of minutes, your own data should start appearing on the Weatherlink world map and updating automatically! It’s difficult to imagine how setting up an automatically-updating weather reporting website could be made much easier. You can include links directly to your own station on your own web pages and also, if you wish and have a little technical know-how, include the data presentations directly on your own website by coding what’s called an iframe in the HTML of your web page (as illustrated below). These are just the features available right now – the Weatherlink website is a relatively new initiiative and we’re sure that Davis will be adding further features in the future. Shown below is a live sample of the screen available for viewing your own weather data automatically uploaded to weatherlink.com by a 6555WeatherlinkIP logger. This examples is displayed in HTML iframe construct in exactly the same way that you could use for yourself on your own web pages. The image shows the current weather at a site near our office in Ely and should update automatically every 5 minutes. The first (upper) image shows our current weather conditions and the second images shows a summary of today’s conditions so far, including today’s highs and lows. Automatic uploads to the weatherlink.com website can also be made by users running the Weatherlink v6 program on a PC linked to a standard USB or serial logger and by users running Vantage Connect units. The full range of website features listed above is available to such users, but both of these alternative upload approaches require an annual subscription, whereas ongoing use with the WeatherlinkIP logger is free of further charge after initial purchase.